An in-depth book about Lough Swilly, edited by a University of Ulster expert on coastal management, is proving a huge success on both sides of the border. 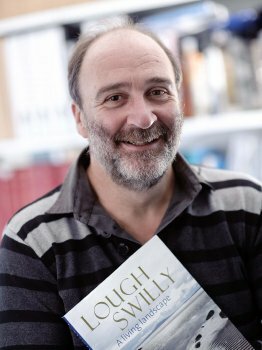 ‘Lough Swilly -A living landscape’, edited by Professor Andrew Cooper, who is based at the Environmental Sciences Research Institute on the Coleraine campus, is well on course to sell-out its initial c.1, 500 print run, according to its publishers. The extensively illustrated full colour volume resulted from a joint project of Donegal County Council and the University’s Centre for Coastal and Marine Research. The book examines in detail the lough’s geology, archaeology, coastal change, maritime heritage, history, fishing, conservation, tourism, aquaculture and recreation. Its final chapter advocates a multi-agency management approach to safeguard the lough’s future. More than a hundred stunning photographs and diagrams, including many landscape pictures taken by the University of Ulster’s Coleraine-based photographer Nigel McDowell, bring the lough’s many faces vividly to life. In April, ‘Lough Swilly -A living landscape’ was a runner-up in the Geographical Society of Ireland’s Book of the Year award. It has sold close on half of its initial print-run since its official launch last autumn. Anthony Tierney, sales and marketing manager of the Dublin-based Four Courts Press, which is one of Ireland’s leading academic publishing houses, said: “It is easily one of the top five big sellers that we’ve published in the past year. We have had an extremely positive reaction to it throughout Ireland, with very good reviews in the press and specialist history and environmental media. Set between the Fanad and Inishowen peninsulas on Ireland’s most northerly coast, Lough Swilly is one of the island’s largest sea loughs and has long been noted for scenic beauty and momentous history, including ‘The Flight of the Earls’ from Rathmullan in 1607. Written by a team of experts, the book explores Lough Swilly from the evolution of the present landscape during the geological past through to contemporary human uses of the lough. Professor Cooper said: “Across the world, it is clear that so much pressure is being put on landscape that we must now manage it more effectively to ensure that it may be used in ways that derive the biggest benefits to themaximum number of people. “Lough Swilly is a place of great natural beauty set in a vibrant landscape that has been shaped by nature and by man. The conflicts and challenges that face it are a mirror image of those in many seaboard areas of Europe. This all stems from the combination of climate change and other environmental factors, and the often competing, social, economic and commercial activities that seek to harness ‘living water’as a resource. “The insights of my University colleagues and the other specialists, such as those who work with Donegal County Council and the National Parks and Wildlife Service, form a bedrock of information which will be of immense benefit to anyone who values Lough Swilly and wants to preserve its resources. Photo caption: Professor Andrew Cooper, Professor of Coastal Studies at the University of Ulster. “This attractive-looking collection brings together a team of geologists, scientists, archaeologists, conservationists and other researchers to produce a wide-ranging scholarly publication on Lough Swilly and its surrounding area in north Donegal. Its eleven chapters investigate such diverse topics as geology and geomorphology, history and archaeology, geography, aquaculture and conservation. The stunning photography on almost every page makes this book a pleasure to open … Lough Swilly is a beautifully presented book with fantastic photography and snippets of information on a wide range of topics,” Adrian Grant, History Ireland (November/December 2011). “I must commend the Four Courts Press production of the book on Lough Swilly. It’s a historically and geographically fascinating part of an intriguing county … there’s access to a huge volume of information on the lough. What really makes the book so pleasing is the amount of space given to photographs, and some very clear maps, too … many are absolutely stunning,” Hugh Oram, Books Ireland (February 2012). “Lough Swilly is here richly portrayed as one of the great maritime cultural regions of Ireland … a handsomely illustrated collection of essays,” Howard Clarke, Irish Arts Review (Winter 2011).